Brazil go through top of Group C, setting up a quarter-final with Paraguay, with goals from Thiago Silva and Roberto Firmino putting them into a comfortable lead. Miku set up a tense ending with a consolation strike cutting the five time World Cup winners' lead to 2-1, but the majority of this game brought Brazil's best play of the tournament and without their best player.Miku could have pulled off an incredible comeback in stoppage time but Josef Martinez's cross flashed just over his head with the goal gaping.Brazil could have ended the game assertively but, rather than build on their lead and fine early play, Dunga decided to ensure he would have four centre-halves on the pitch. 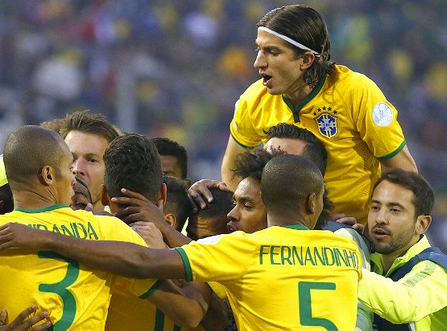 It is no surprise that Brazil then invited pressure, and almost totally succumbed to it. Robinho injected energy into Brazil as a whole and was a general hub of creativity and action. This is not to sideline the exceptional Neymar, but Robinho did ensure that, in this game, Brazil looked so much more cohesive,he restored a bit of life into Brazil.There was a time, of course, when Robinho was widely expected to have the kind of career and status that Neymar has.